This summer and fall, International Business and Marketing and Sustainability student Aaron Bredl went on an International Business Exchange program to Santiago, Chile. He worked for entrepreneur Oscar Muñoz’s business, Green Glass, as a graphic design intern responsible for running digital media ad campaigns. Green Glass collects used glass products such as bottles, cuts and fires them, screen-prints them with a design, and sells them back to consumers. It is among many companies in Chile dedicated to recycling. Green Glass not only provides environmentally sustainable services to customers, but also uses socially sustainable employment practices, hiring immigrants and people in need of second chances in life to cut and fire the products. While working for Green Glass, Aaron got to attend a large-scale, high-end, business boutique fair to promote the company, help crate bottles to be recycled to Oscar’s workshop, and learn more about a successful sustainable business model in a foreign country. Under the wing of a respected, true entrepreneur in Oscar Muñoz, Aaron learned more from his experience than he ever thought possible about the inefficiency with which society is currently handling waste. 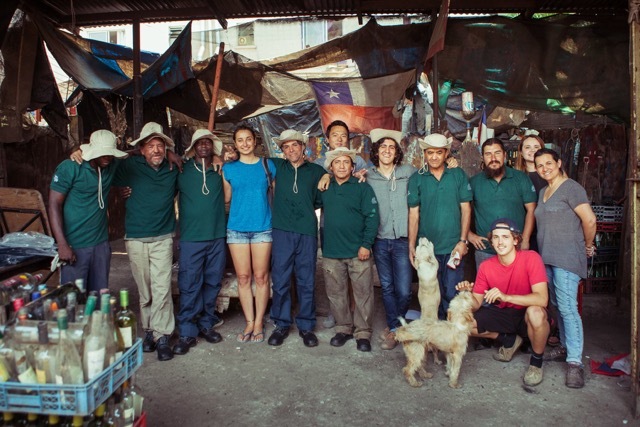 Aaron also learned about the “Recicladores de Base”- the millions of people in Chile and other countries who sort through trash to find recyclables. These workers make very little money doing a service to environment and are often not properly respected for it, and Aaron learned firsthand about their struggles while abroad. Aaron is seeking to work towards sustainability and proper treatment of “Recicladores de Base” in his career. Having graduated in Winter, he is currently seeking a job similar to his practicum in Seattle to give back to his community and the environment. Using what he learned in Chile, he is bound to succeed. “Between Earth and Sky” Film Screening! The Harward Endowed Lecture Series and OSU Department of Crop and Soil Science are hosting a film screening of “Between Earth and Sky” to help OSU go Beyond Earth Day! Registration for Beyond Earth Day has Begun! Check out and register for any event during Oregon State’s Beyond Earth Day celebration! Still Spots Open for Sustainability Study Abroad in France! All OSU students have an incredible opportunity to explore France and earn credit, all as part of a comparatively inexpensive Study Abroad! For his Sustainability Practicum, International Ecotourism and Sustainability Major Roarke Jennings worked on an aquaponic farm in Washington that uses fish instead of soil to provide local and sustainable produce for the surrounding urban community.